1. Brundavan Laboratories - Walk-In for Asst. Manager / Dy. Manager - R&D on 2nd Feb' 2019..
2. Avra Laboratories Pvt. Ltd - Walk-In Drive for Freshers & Experienced - R&D / IT Operations on 2nd Feb' 2019 @ Hyderabad. 3. USV LIMITED - Walk-In Interview for Freshers & Experienced - Manufacturing & Packing on 2nd Feb' 2019. 4. Alivira Animal Health Ltd - Walk-Ins for QC / QA / Production / PDL on 2nd Feb' 2019 @ Vizag..
5. IQVIA - Walk-In Interviews for Freshers & Experienced Pharmacovigilance on 2nd Feb' 2019. 6. Premas Biotech - Walk-Ins for Manufacturing / Analytical & Process Development - Biologics on 14th & 15th Feb' 2019 @ Hyderabad & Bangalore. 7. MSN Laboratories Pvt. Ltd - Walk-In Drive on 2nd Feb' 2019 @ Hyderabad. 8. Sai Life Sciences Ltd - Walk-In Drive for API Clean Room Professionals on 2nd Feb' 2019 @ Hyderabad..
9. Hetero Labs Limited - Walk-In Interviews for FR&D / IPR / EHS on 2nd Feb' 2019 @ Hyderabad..
10. Mankind Pharma Ltd - Walk-In Interviews for Multiple Openings (30 Openings) on 1st & 2nd Feb' 2019. 11. AMRI - Walk-In Interviews for Research Chemist on 2nd Feb' 2019 @ Hyderabad..
12. Walk-In Interviews for Freshers on 2nd Feb' 2019 @ Solara Active Pharma Sciences. 13. AUROBINDO PHARMA LTD 0 Walk-In Interviews on 1st & 2nd Feb' 2019 @ Jadcherla..
14. Divis Laboratories Ltd - Walk-In Drive on 25th Jan to 6th Feb' 2019 for B.Pharm / B.Sc / M.Sc / B.Tech / SSC / ITI Freshers..
15. INTAS PHARMA - Walk-In Interviews for Multiple Positions on 3rd Feb' 2019 @ Vadodara & Nashik. 16. MACLEODS PHARMA LTD - Walk-Ins for Freshers & Experienced - Multiple Positions on 3rd Feb' 2019..
17. Jubilant Chemsys - Walk-In Interviews on 3rd Feb' 2019 @ Hyderabad. 18. Baxter Pharmaceuticals - Walk-In Drive on 3rd Feb' 2019 for F&D / Stability Studies / Utility / Production. 19. Mankind Pharma Ltd - Mega Walk-In Drive for Multiple Positions - Production / QA / QC / Microbiology on 2nd & 3rd Feb' 2019 @ Indore. 20. Alembic Pharmaceuticals Ltd - Walk-Ins for Multiple Positions - Production / QC & AMV / QA / Quality IT on 2nd & 3rd Feb' 2019. 21. Piramal Enterprises Ltd - Walk-In Interviews for QC & QA on 3rd Feb' 2019. 23. Anthem BioSciences - Walk-In Interview for Quality Control on 9th Feb' 2019 @ Bangalore. 25. 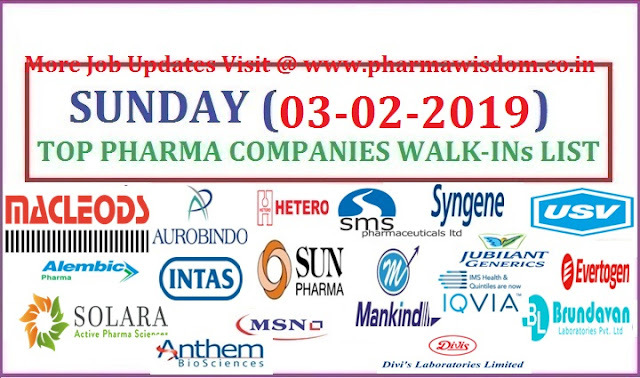 SMS Lifesciences India Ltd - Walk-Ins for Multiple Positions (70 Positions) on 8th & 9th Feb' 2019 for Production / QC / QA / R&D. 26. Walk-Ins for Asst. Prof. / Assoc. Professor - Pharm.D & Pharmacy Practice on 4th to 7th Feb' 2019 @ Arya College of Pharmacy..
27. Evertogen Life Sciences Ltd - Walk-In Drive for Quality Control (20 Positions) on 2nd Feb' 2019.